Lola, a fifty-two-year-old mother of five who is working in America to pay for her own children’s higher education back in the Philippines, becomes their nanny. Lola stabilizes the rocky household and soon other parents try to lure her away. What she sacrifices to stay with Claire and “Williamo” remains her own closely guarded secret. In a novel at turns satirical and heartbreaking, where mothers’ modern ideas are given practical overhauls by nannies, we meet Lola’s vast network of fellow caregivers, each with her own story to tell. We see the upstairs competition for the best nanny and the downstairs competition for the best deal, and are forced to ask whether it is possible to buy love for our children and what that transaction costs us all. It looks into two contemporary marriages—one in America and one in the Philippines—and witness their endangerment, despite the best of intentions. 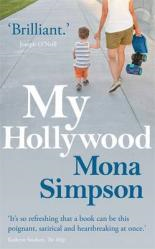 My Hollywood explores the expectations and sacrifices of some Hollywood mums and the nanny’s they employ. It captures both the isolation and the guilt that comes with raising small children, the imbalance of male and female roles in parenting, and the struggle of retaining a self outside of that. It alternates between the perspective of the mother and the nanny with introspection and judgment on both parts. It is slow moving and quite frankly if you are a mother quite depressingly familiar, despite the vague Hollywood factor. The conclusion is not as exciting as you want it to be, and truly although these issues are very close to home and seem important we don’t feel the need to read about them whilst we are living our own version of them. This entry was posted in Book Reviews, Fiction by Parra Reader. Bookmark the permalink.